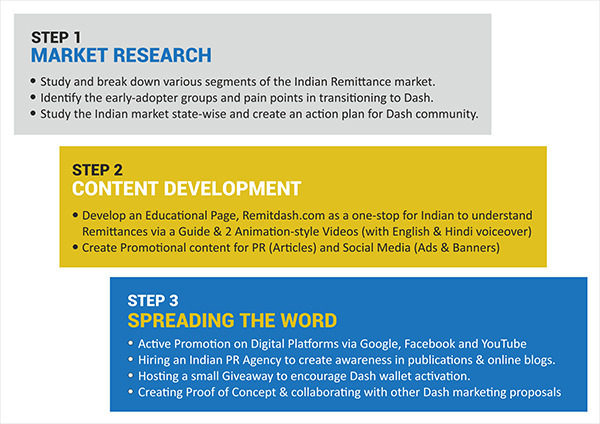 This project aims to build the use of Dash for Instant Crypto-Remittances to India - the world's largest market through an outreach program involving Market Research and Analysis, Online education and collaborations with other advertising proposals from the dash community. We aim to tackle this market through a simple, three part process. For expatriate workers, losing hard-earned money to money transfer companies for remittances, earned in often challenging circumstances is a travesty. However, they have little recourse or choice, given the lack of credible options and high adoption of existing methods. 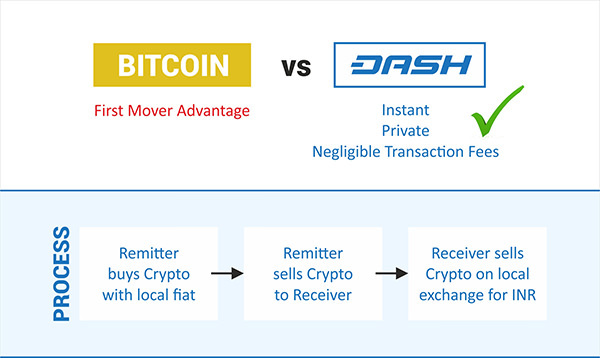 However, with crypto-remittances emerging as a new alternative, it is increasingly becoming possible to use currencies like Dash to send money instantly, globally and at a very low cost, challenging the hegemony of money transfer companies like Western Union. 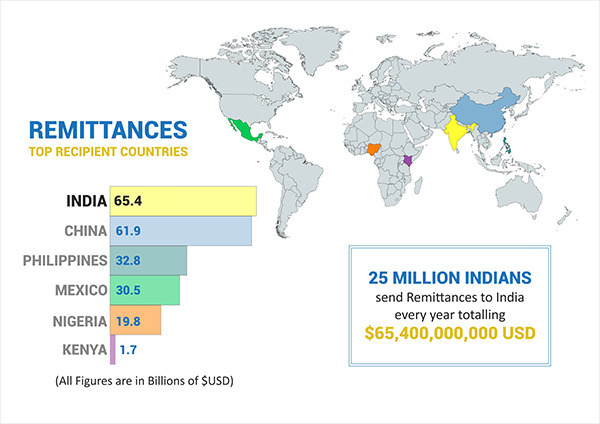 India is the world’s largest Remittance market. With a 25 Million strong expatriate population, Indians send back $2800 every year on average, totally nearly $66 Billion USD every year. According to a World Bank study, the median cost of transferring money has remained nearly constant at 7.2%, making money transfer a $4-5B/yr market for transfer companies like MoneyGram and Western Union and Banks (via Wire Transfer). Recently, the Indian Government imposed an additional tax of 12.36% on remittance charges, making traditional remittances even more expensive to process. This makes the overall cost of sending money significantly higher than World Bank’s Sustainable development goal of 3%. With a population similar to the entire continent of Africa and rapid penetration of internet through low fee 4G Data plans, India is on the cusp of a mobile-first internet revolution. While money-transfer technology has remained stagnant, the growth of blockchain currencies has created an exciting alternate path for money transfer, leap-frogging existing channels. A small set of early adopters have taken to Crypto, mainly Bitcoin, to remit money. While it is difficult to quantify exact numbers, the money transfer industry is going through a wave of silent disruption. Since retail prices for Bitcoin are 10-20% higher in India, every dollar sent also creates a net profit of 10-20% for the receiver, instead of a net loss of 8%. Overall, the gap between sending money through Bitcoin versus traditional channels can be between 18 to 28%. This significant arbitrage opportunity means that there is enough buffer to cover the high Bitcoin mining fees quite comfortably. 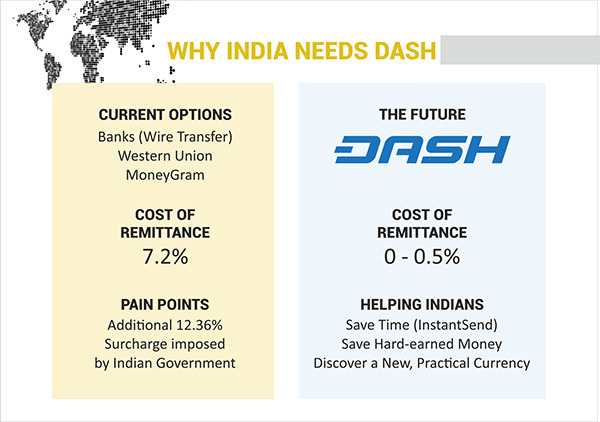 While Bitcoin has a clear headstart in terms of awareness and adoption in India, it is an acknowledged fact that Dash is far better suited to facilitate Remittances than Bitcoin. Dash is instant, private and costs a negligible amount of money to send - features that are critical to Remittances, missing in Bitcoin. With exchanges in India beginning to integrate with Dash, there is an opportunity to promote the use of Dash to consumers for remittances and present Dash as a credible option to consumers and close the gap with Bitcoin. Out of the $70B sent by 25 Million expatriates to India each year, there are a large number of segments and corridors. The first part of this project aims to study the various segments in this market and understand early adopter groups better for targeting in the later part of this campaign. For Eg. The Middle East and North America are the top two remitting regional segments and the states of Punjab, Kerala are amongst the highest receivers of remittances. Through in-depth research across the states of India and the factors underlining their remittance options, we plan to submit a research report beneficial to the entire Dash community that believes in the power of Dash for remittances and can harness the information for further advancements in growing Dash as a viable option for remittances. We seek to cover the opportunities in the market for introducing Dash to new users as well as the challenges. With India being the biggest remittance market, we must explore all possibilities of introducing Dash into the system. 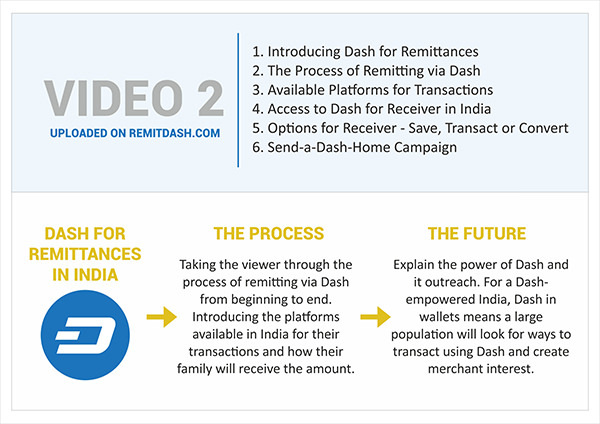 We aim to create a easy-to-understand videos in both Hindi and English, explaining how Dash can be used for Remittances to new users. Via the two different versions, we will walk users through the advantages of Dash and the process to make remittances to their families in India. To promote Dash as a alternative to Bitcoin for Remittances, we intend to target technically savvy users from segments identified via our project research. Building blockchain usage for the remittance industry is newsworthy development and an emerging use-case for crypto-currencies and we hope to get ably covered for our project via PR and collaborations with the marketing experts in the Dash community. A1. Yes, Dash can directly be traded for fiat on local exchanges and trading desks like WazirX and Buyucoin. Q2.What if the Dash value increases/decreases in the three months period ? A2. In case of a decrease in the Dash value, we will still honor our commitment on the deliverables and complete this proposal. In case of an increase, we will funnel the money towards the marketing and Send-a-Dash-Home campaign till we exhaust the funds. We have updated our milestones and progress on Dash watch. They should hopefully post it soon. 1. Research Report : the team is currently working on the draft report. 2. 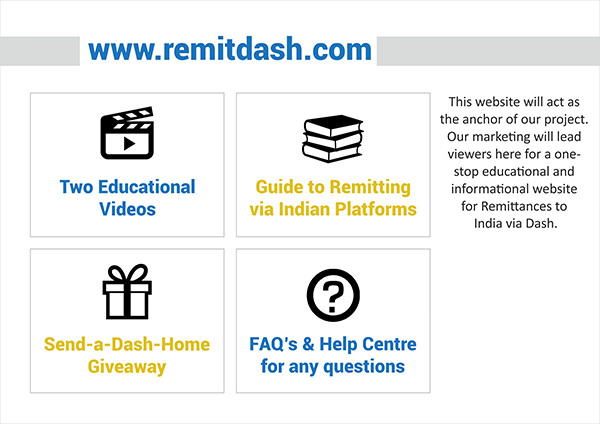 Guide to Remittances : We are collecting and compiling information and creating an access guide. 3. Videos & Landing page : The design team is coming up with storyboards and wireframes which we are brainstorming on and finalising for further action. We will share more updates and outputs as soon as they are available for community feedback. With regards to the India Central Bank banned on cryptocurrency. I believe that the Central Bank fears cryptocurrency because how quickly it gained adoption in that country. Otherwise the bank would have ignored cryptocurrency like we are seeing in so many other places. This is a good sign where we should be targeting. There is no sense in targeting a population that has no interest in cryptocurrency. This will be a fight and Dash should be in the forefront. Excellent proposal. Our newest ad is focusing exclusively on remittance. Would love to chat about your ongoing work on Discord. Thank you Pieter_Eralith. I'm available on Discord with the same handle supreetraju. Would love to see the ad. voting YES. Payments are our focus. When I was in Aurangabad in 2016 I advised three hotel staff to get some Dash. I tipped them with BTC. These days it would be Dash tips only. Anyway.....please think about having a presence across media such as STEEMIT for PR reasons. Thank you so much Criticalinput for your vote and the tip. We are developing our strategy for Steemit, its a great platform to reach the early adopters. What is your plan to get the word out about DashRemit.com now that Google and Facebook ads -- both of which are mentioned in your proposal -- are off the table? a) PR activities : We would focus on getting the word out to remitters via Magazines and Technology Blogs through a targeted PR campaign. b) Send-a-Dash-Home campaign: Simple giveaways to remitters to send a some Dash home to their families so they can get acquainted with the crypto-remittance process. We would be design a simple referral hook to ensure every user can bring in more without spending money on active acquisition. c) Collaborations: We intend to work closely with other Dash-sponsored platforms on directing their advertising into our remittance use-case. By aggregating traffic from different sources, we should be able to generate enough traffic. 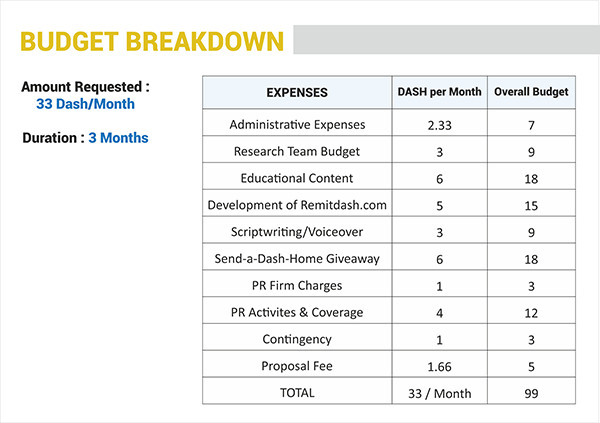 We haven't requested a budget for digital marketing, to keep things simple, choosing instead, to partner with other Dash community advertisers for traffic. However, they are some work arounds to the crypto ads ban. Variations of Ads that promote blockchain technology education remain largely unaffected by ad bans and get approved barring a few exceptions. Google is available as a fall back option till June, post which, new permutations might arise. We intend to explore the potential of every channel to find our audience and engage them with our video content for a lasting Dash impression. A well thought out proposal for a correct price. YES. Thank you so much for your support, ec1warc1 ! Thank you so much, Schnuppdog. Truly appreciate your support ! its what Dash is for. Well presented proposal. Fair price. You have my support. Things like this are what we need to be funding. 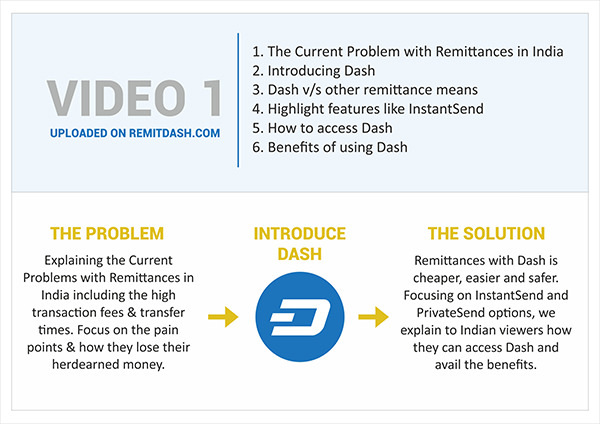 The remittance market by itself could take Dash to the moon. It's a 530 Billion dollar industry. They typically charge several percent, and the exchange rate you get often is not a fantastic rate. Taken together, the remittance market is very profitable. And the transfer can take several days. In every respect, Dash can crush those performance metrics. The price strikes me as very reasonable. I would like to see more discussion about marketing, in light of the fact that Google and Facebook have, or soon will, ban ads for cyrpto products. Thank you so much for your support, Solarguy ! We want to make it simple for foreign workers to send money back home instantly. Many often work in challenging circumstances abroad and it is painful to see remittance companies take away chunks of hard-earned money meant for their parents and children back home. Dash can make a small but telling difference to their lives. 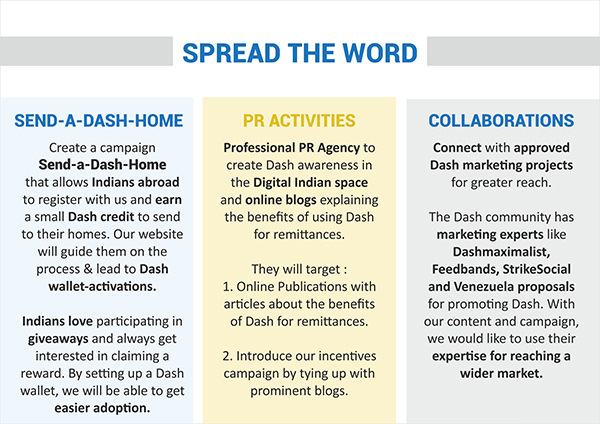 In terms of marketing, we want to partner with other dash community advertisers for user acquisition but run a small part ourselves to begin with. We seek to take an analytical, data-driven approach to identify good fits and strategies. Ultimately though, we believe we can get strong referrals through quality learning design and solving a real problem for consumers. We hope to make our offerings so strong, that we don't have to rely on large ad spends to scale the use of Dash for International Remittances. Absolutely yes. Very nice proposal you put together. These are the small projects we need to be supporting. This is a practical application of what Dash is meant to be doing. Just like with Venezuela, Dash can solve a problem for people in India. If MNO bother to do any research and follow social feeds they will quickly discover that the Venezuelan Dash community is growing exponentially. The same thing should and can happen with India. In fact, if you read the pre-proposal you will already see there is contact being made from QuickWallet, they are interested in working with this project. There is already a community forming and the project hasn't even passed yet. All in all, it will be a crying shame not to see this small proposal pass but some of the other bloated proposals pass. 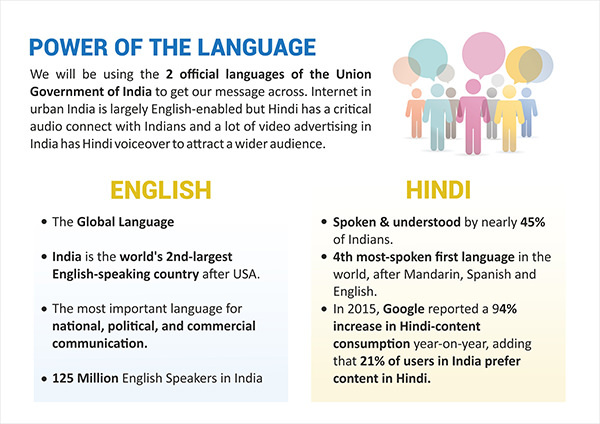 This will be a great website to provide educational information and a growing contact point for social feeds in Hindi. Thank you so much, RobbyDash01 ! Given a chance, we would strive our best to grow the Dash India community. Thank you so much for your support, Dashracer !